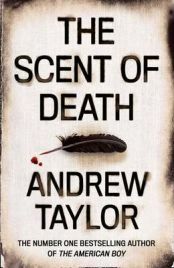 Andrew Taylor is a writer known for producing a small number of high quality books that straddle the historical/crime divide, and The Scent of Death is no different. Having previously read and rather enjoyed his best-known novel The American Boy, I was eager to get stuck in to his new offering, a 470 page hardback novel: reassuringly weighty, handsomely covered and embellished with accurate colour period maps inside (this I find a good sign; if a historical novel has proper maps in it, it is generally an indicator that the research has been done thoroughly). Thoroughly turned out to be the right word – what followed when I began reading was a book rich in period atmosphere and sense of place. On a blisteringly hot day in August 1778, a ship from England successfully evades the French blockade of New York and slips into harbour. What will later become known as the War of Independence is currently raging across the continent ahead. British Manhattan, however, remains loyal to King George and as such is a heaving mix of soldiers, refugees, profiteers and double agents, who travel to and from enemy lines across the Debateable Ground that rings the city. Food is sometimes scarce, crime is rife, and a section of the city that burned down two years previously has become a slum known locally as Canvas Town from the makeshift tents and covers the inhabitants make as shelter. Nobody has had the time or the money to even think of rebuilding the neighbourhood. Into this uneasy city steps Edward Savill, a minor civil servant from the American Department, sent as a special envoy to assess claims for compensation against the crown as a result of the war, and as a secondary role to “report on the administration of justice in the city in all its aspects”. It is acting in this secondary role that forces Edward to confront the body of a murdered gentleman in Canvas Town on his first day in New York, observing due process to make a suitable report back to his masters in London. But there seems more to it than a simple robbery gone wrong; the murdered man apparently has a connection with the down-on-their-luck family he is lodging with, the Wintours (the elderly Judge, his ailing wife, their flighty son Jack and his attractive wife Arabella) in the shape of a “box of curiosities” that several characters are keen to get their hands on. “For some people,” Savill is warned soon after his arrival, “loyalty is a commodity.” On the surface this refers to the political allegiances of New Yorkers, but as the story develops, we see loyalty being a key theme running through the plot. While this is ostensibly a crime novel, I should add that this is not your average historical detective piece. It is true that Savill’s role gives him good reason to visit the crime scene, to indulge in some investigation of the man’s death and follow legal proceedings, but he does so not as a detective, but merely a gentleman trying to do the right thing for an unfortunate soul. He is somewhat awkward and reluctant in this charge, and the murder forms only one strand of the carefully woven plot. It is also slowly paced and measured; some readers may find it plodding and over long, but this is not a thriller to be filled with numerous chases and improbably dramatic turns. The Scent of Death is instead a slow-burner meant for long, comfortable nights curled up on your sofa, gradually progressing towards a satisfying conclusion. I read with interest on Taylor’s website that he is currently working on a new novel featuring Edward Savill. I shall follow this with great interest – Savill is a character with great potential and with writing of this quality to keep me entertained, I look forward to reading more about him. No Comments on "The Scent of Death"